At Internshala, every week we process thousands of internship applications and talk to hundreds of companies to find out what made them not consider (or consider) a particular candidate. Here are the top 5 mistakes applicants commit which lead to their applications being ignored by the companies, and how to fix those mistakes. This information is clearly mentioned on the internship details page. If your profile does not match with what the company needs, you can’t apply for that internship. Take, for example, a student living in Mumbai trying for an internship in a company which only needs applicant from Delhi. He can’t apply for that internship. Tip: Fill details about your internship preferences on your dashboard and select the option ‘Show internships as per my preferences‘ (one click search – see image below) while searching for internships. This way you will only be shown relevant internships that you are interested in and which matches your profile. 2. Why should you be hired for this internship? – is a question that you have to answer for every internship that you apply to on Internshala (see image below). Your answer to this question is really crucial part of your application and make sure you don’t make following 3 mistakes that most students who do not get selected do. Copying a generic answer from the internet – Answer to this question depends on the internship you are applying to and your profile, and even Google can not answer this for you. Moreover, a plagiarized answer is easy to spot (if you can Google the question, the employer can also Google your answer). Bad English – Answers riddled with spelling mistakes, poor grammar, lack of punctuation and proper capitalization, use of SMS language are sure signs of someone who either has poor communication skills or is not serious. Giving the same answer for every application that you make – This is not a major crime as long as the answer has been well thought of. However, every internship and every company are unique and a bit of customization would help you secure an interview. What will certainly not work is when you write the same answer for two very different type of internships (say one Management, and other Technical). Tip – A good answer should demonstrate why are you interested in this internship with this company and your capability to do the work i.e. what skills or past credentials you have that can convince the company that you can do the work. See a good sample answer. 3. Work Experience not highlighted – Most companies, while selecting interns, prefer candidates with past examples of similar work in the area of internship (say someone having developed a website for college fest and applying to a Web Development internship). You need to show the employer what you bring to the table. Most companies prefer candidates with past examples of similar work in the area of the internship. The more internships and project experiences you have under your belt, the better. This information is displayed separately to the employer, along with your application, improving your chances of getting shortlisted. Though, make sure that you include only relevant experiences – an employer doesn’t need to know what singing competition you won in your high school. Many students ignore this section and lose out on internships, make sure you are not one among them. 4. Outdated contact details – Many students change their phone number (especially when they go home during summer/winter break) but forget to update it on their Internshala profile resulting in companies not being able to contact them even if they are shortlisted! What a silly reason to miss on a great internship opportunity. Make sure that you always keep your phone number updated on your Internshala profile (you can do so at Edit Profile). Ensure that the same number is updated in your resume also. 5. A weak profile – If, even after following all the mentioned points, you still did not hear from the company then the most likely reason is that your profile somehow did not stand out among the competition and there were better applicants. If there are things that you could do to strengthen your profile such as undergoing some training on the subject, taking up few online courses in that area, working on a project independently or with a professor, taking part in more competitions, attending events/seminars etc. ; we highly recommend you do that. The only way to beat the competition is to become better than them. Tip – Don’t be content with just completing some training/courses. You need to show the employer that you have actually used the knowledge in a practical application and have built an original product. Take, for example, someone running a blog, or creating an app/website in college. So now you know why your internship application(s) may be getting rejected or ignored and what you could do to avoid that in future. If you could think of any other reason, we would love to hear it; please comment below. Now that you know all the secrets, what are you waiting for? Register here and start applying to your dream internships! i had been shortlisted by a company 2 days ago.but now the application status shows rejected.Can u please explain the reason for it. Please note, this might be because the employer initially liked your profile but then finally decided to not take it further. Good luck for other applications. You can improve your resume by reading a few articles here. We suggest you to view latest Finance Internships here.
. I am pursuing my MBA at IEM college in Kolkata. I want to take finance as my specialization. The starting date of my SIP will be around 1st week of June. So if you can please suggest me which companies will I get to do internship in Kolkata then I will be very grateful to you. We suggest you to visit http://internshala.com/internships/finance-internship and apply to the one(s) which suit you best. Hello, I am a student of petroleum engineering.Can i get any summer internship from your site.?? Thanks for your reply but I want to do my SIP in Kolkata that too in finance ground and not in any trading company. So please if you can help me by any way then please I would like to request you to do the same. I am B.Tech graduate in INSTRUMENTATION & CONTROL ENGINEERING with Honours degree. Kindly guide me to select for most appropriate company/organization, if possible, then please suggest me the names of some of the siutable companies. i am 3rd year engineering student of CSE. i like to undergo internship in s/w companies to have an experience . do i have an oppurtunity to do my internship an any MNC companies?? can you plz tell me which companies would offer internship to students ?? I am pursuing M.Tech 1st year in the stream of computer science.Now i am in 2nd semester and it will be completed in october. Can you suggest me internship to do my project work as a part of my 2nd year of M.Tech. We suggest you to visit here for CS Internships and apply to the one(s) which suit you the best. Hello sir, I have a question about application status. Do companies mention whether a particular student has been ‘rejected’, if not hired? Or the status remains ‘active’ even if we don’t get selected? i am civil engineering student (btech 3rd year) studying at iit bombay. i want to apply for some good internship in gurgaon (preferably core interns) .can you suggest some?? You may keep a tab here for latest Civil Internships and apply as per your requirements. Hie i am a second yr Bms student and want to do internship in marketting (not sales marketing) for june and july. Could you please help me out in guiding me with the companies. You may view the latest Marketing Internships here. I m final year student of electrical engineer and wish to do internship for June -July. Please suggest me some suitable companies. We suggest you to visit here. We suggest you to find the latest internships here and apply to the one(s) which suit you the best. I have completed my 2nd year in mechanical engineering please suggest me some internships for june-july. We suggest you to visit here and apply to the internship(s) which suit you the best. i am student of law (Ba.llb) currently in 6th sem. Please suggest me some internships . Please visit here and apply to the one(s) which suit you the best. I have just completed by b.tech(agricultural engineering) from CCS HAU hisar. May i get any internship in any companu.My starting period will be from 2nd week of june. Duration may be 2 months to 6 months. I have completed 3rd year btec in the streme of civil engineering. May I get any internship in any company. I want to learn work and do work. My starting period will be 1st week of June. Duration may be 1month to 2months. Please view the latest Civil Internships and apply to the one(s) which suit you the best. hello sir.. i m a student of B.A economics 4th sem.. can u suggest me some internship.. I am a student of BBA, recently completed my 4th semester. I want to do my 2 months compulsory summer internship. So, please suggest me some good internship. We suggest you to view latest Management Internships and apply to the one(s) which suit you the best. sir ,I am a student of chemical engineering, recently completed my 4th semester. I want to do my compulsory winter internship. So, please suggest me some good internship related to my stream. We suggest you to view the latest Chemical Internships and apply to the one(s) which suit you the best. We suggest you to visit here for latest Civil Internships and apply to the one(s) which suit you the best. Sir, recently i completed my graduation in computer science and engineering (B.E.) having 66.88%. I want to join any internship. Please shall you suggest me any of internship. We suggest you to keep a tab on latest Computer Science Internships and apply to the one(s) which suit you the best. You may also subscribe to our weekly updates – http://internshala.com/subscribe. Sir I am pursuing my btech in electronics(instrumentation and control) from thapar university patiala I m currently in 2nd yr I want to do internship next yr during summer vacation sir can u tell me when should I apply for internship in a company? Usually the best time to apply is 1 to 2 months before. recently i got shortlisted by a company initially through intershala for internship but now status show rejected now whyis it so??????? i also got an official email regarding this internship ???? This might be because the employer liked your profile but finally decided to not move with it further. We suggest to try applying to other internships. Hello sir … I am in 3 rd year from civil branch …. I want join company for summer training in July … So please tell me about process of joining company.. I have registered on intershala but no internship option came to me till now can u plz tell me .. I am pursuing MBA in finance and marketing I want to do internship in a MNC . plz reply. Please check your spam folder and other tabs. Also, you may keep a tab here – http://internshala.com/internships/mba-internship and apply to the internship(s) which suit you the best. You may check the link below for work from home internships. i am sravani rudrapati currently pursuing BA PROGRAMME[1st year]in lady shri ram college. i want to gain experience in the field of internships. what do you suggest that i do for starters. p.s:- i am more interested in social work. I got astonished on seeing your website. it’s helpful to all students. I had finished my ME embedded system technology 2015. I want some internship and guidance. I’m 2 year from information science…can you suggest me an internship for January 2016. How can a person having less CGPA(say 7.00), present it in his resume so that it gives a good impression ? Hello sir, I am second year students from computer branch.Please suggest me suitable internships. Hello. I am on doing btech in information technology stream(2nd year). I am looking for intenship. But i am not able to find the right intenship to apply which will be usefull for my field. You may visit here for the internships in Information Technology. You may visit here for internships in IT. I have completed my Masters in Agril.Entomology and currently seeking for internship. As of now, we do not have any internship in Entomology. You may visit here for internships in Biology. I have completed MCA in 2010.i don’t hv any experience of .acept of teaching .May I get any internship in any company. I want to learn work and do work. My starting period will be 15 dec Duration may be 2 month to 6months. You may visit here for Computer internships in Computer Science. Sincere apologies for the late response. You may visit here for the internships in Computer Science. I am student of Mca 5th semester and now I want to do internships in best companies for purpose of learning. And my interest in java so how will apply in company bcoz I don’t know who company is good for me plzz suggest me. You may visit here for internships in JAVA. I am student of MCA final year.Please provide me the option of finding internships in Mysuru(Karnataka). As of now, we do not have any internship at your preferred location. You may visit here for Computer Science internships at other locations. I have passed my B. Tech (ECE) in 2015. I want to gain knowledge in communication field so that I can get jobs in that respective field. Please kindly help me and advice me what to do and where to apply. I will be very thankful to you. You may visit here for the Electronics internships. I am a graduate with bachelor’s of engineering in electronics and communication for college of science and technology, Bhutan. I am looking for an internship program for my profession mention above in west bangal, can you please suggest me. As of now, we do not have any Electronics internships at your preferred place. You may visit here for the Electronics internships at the other locations. Please visit here for the summer internships, and apply for the one which suits your profile. Please visit here for the internships in Biochemistry. i am a student of class 11th and my wish is to work with any NGO and i also like photography very much, so can you please help me out. Thank you for writing in. Check this link for the NGO internships. Visit here for the Photography internships, and apply for the one which suits your profile. I hope you find it useful. I am pursuing M.Sc . biotechnology last yr . i want to do internship, can u plz suggest me where i have get the internship in biotech. Please visit here for the Biotech internships, and apply for the one which suits your profile. I am completing Ist year in college. I am an arts student and am looking for an event management, marketing or content writing summer internship in Bangalore to learn more and gain experience. If you could please send a link that will help me out. Apply to the ones which suit your profile the best. I am a student of bba 4th sem,and want to do summer training in hr from jaipur for one month. And apply to the ones which suit your profile the best. I want to know is there any problem in migrating from one college to another.Does it create problem in getting job orfor career? If you have a good reason for migrating, do it. It won’t create any problems in getting job offers. sir I am a third yr mechanical engineering student, I don’t have any awards,participation or experience..
Can I get internships? Can u suggest some companies? Of course, you can. It’s not necessary to have awards and achievements in past to get an internship. You may write to student@internshala.com for further queries. We will help you out. I am Mechanical Engineering student 2015 Pass Out Student …I have completed Certification in Design Softwares Auto Cad, Catia ,Proe, Nx Ug , Solidworks.. Suggest me Internships. Related to Design. Yes, there are many opportunities to do s/w internships in MNC’s. Please visit here for the Mechanical internships. I am pursuing 2 degrees simultaneously. But the profile does not allow me to enter two UG degrees. Please help me on how to update the same in my profile. Please drop a mail at student@internshala.com regarding your query with all the details. We will help you out. I.am a 2 year bsc maths hons student . I want to do an internship to hav an experience . Do i have an opportunity to do so ? Sir i want to do online and offline summer internship training on autocad and solid works..how can i do that ?.. You can also search on Google or in your locality for the offline training. Can you please help me to find proper internship? ?I am second year student of engineering(information technology) so sir can you please suggest me some internships??? i am in first year mba, final exam is from 7 may to 14 may after that we have to do summer internship…. Please visit here for the Sales and Marketing internships. It takes time for the employers to process the applications. Generally, it takes 2-3 weeks to complete the entire process. If there is a good match between your profile and the internship requirement, the employer will shortlist you and can take face-to-face interviews, telephonic interview or give you some tasks to perform. On the basis of your performance in these, you are selected for the internship. i completed my 3rd year from computer science dept. and i want to do some internships which are related to my dept. can you please suggest me some details about the internships. I AM IN IV YEAR PURSUING ARCHITECTURE AND LOOKING FOR INTERNSHIP FOR 6 MONTHS FROM JULY 2016 TO DECEMBER 2016. PLEASE HELP ME OUT REGARDING THIS. I have completed B.TECH in Mechanical Engineering. Would you suggest any companies. I want to apply in IBM Bangalore for internship in hadoop or big data as my field.Please guide me how to apply for the same. I want to apply for internship in IBM, Bangalore for course hadoop or bigdata. Please guide me for the same. As of now, we do not have any information regarding the internship with IBM. I have completed my B.Sc in chemistry n looking for an internship in Mumbai. respect ….SIR i am newly joined this intershala website can u please help…me how to get started …in the intershala….presently…i am persuing my b-tech….3rd year…in computer science engeniring…..so would u plz….guide me…. Apologies for the delay in response. Sir i am abhishek .i have done B.E in electrical and electronics .so i can try internship so plz any suggested to in which company. I am a student of Agricultural Engineering, and I want to internship at Food Processing companies. Would you suggest any companies. And apply to the ones which suit your profile the best. Hope it helps. Im presently pursuing my second year B.E with Computer science as my branch.I have applied for 4 company’s seeking internship but I have not been recruited.I want to work for some company so that I will know what is internship all about and through intershala I wanto get that experience.please help me with this issue and help me get hired! Apologies for the inconvenience caused. In general, due to a large number of applications employers get in touch with only those candidates whose applications they like. In the meanwhile, I would recommend you to apply to more internships to increase your chances of getting hired. Please also go through this article http://bit.ly/ishelp to improve your chances of getting shortlisted. I am pursuing my masters degree in Psychology from PU Patiala, Punjab. please conduct an internship in the field of Counseling OR on Mental health. Shall be very thankful. I have completed PG Diploma in Web Designing in 2015 . I just got to know about Internshala and even applied for 3 jobs. I wanted to know that when will the results come and how will i get to know whether i am selected or rejected? Thank you for writing in. If you get selected for an internship, the employer will notify you. Also, keep a tab on the dashboard for the updates in your application status. So, sir please guide me.. I am Fahad pursuing B.tech in Computer Science(3rd year) and doing Web designing from NIIT institute. I want to do an internship in web designing. Can you help me in doing so? Iam Prachi pursuing B.tech in electronics and communication (4th year).i want to do an internship in my final semester. can you please help me in doing so? How can we know that you forwarded the candidate application to the companies. Is that any acknowledgement letter that you received from company. Because i didn’t get any mails any information form any company, it’s been 6 months. We applied in the company, we received your mail. We rejected from the company, we didn’t even received your mail for further process. Did you seriously forward our resumes to the company? I am asking you not blaming you. I am highly disappointed from your all these processes. Extremely disappointed to hear that you had a bad experience with Internshala. Regarding the process of sending an application, all applications are automatically sent to the employer & they have full control as to whether they want to select or reject a candidate. We always recommend that you apply to multiple internships at a time to increase your chances of getting selected to at least one internship. Thanks for getting in touch. I am srinivas.I completed my B.tech this year only. I want to do the internship based on Oracle SQL.so,please suggest me. Do check out the internship profiles before you apply! hi, i m doing my final year MCA. my project duration is 6 months.. can i do internship for only 6 months? Thanks for writing in. You can apply to 6 months internships as well. i am 3rd year engineering student of CIVIL. i like to undergo internship in some good companies to have an experience . do i have an oppurtunity to do my internship an any CIVIL companies?? can you plz tell me which companies would offer internship to students ?? We suggest that you look into the internship descriptions to figure out which internship excites you. I am student of Third Year E&TC Engineering from Pune University. We don’t really get a long holiday for a 15-20 days internship. Can you please suggest me some online internships? I am cuurently pursuing B.Tech in Chemical Engineering (1st year). Am not able to find ny compatible internship for me. Is there any internship to work from home for which i am eligible? Also check the latest work from home internship in Civil. Hello mam my name is Vaishali. currently I am living in pune. I have done MBA with IT and Finance stream,from Indore in 2016. Before this I have done M.Com from Indore in 2014. If I talk about my skills then I am familiar with ms office, tally,autocad,Html, C programming. can you plz tell me which companies would offer internship to students ?? I am studying BCA 2nd year. How can I get an internship related to my field.?? perfect in c programming & and also i am learning “java” presently. How can i get the internship.? please suggest me. I have completed my BE(Electronics and Communication). I aspire to be an investment Banker. I have no idea how the system works in the finance field. Please advice me what should I do in this situation. How can i get good internships to learn things about financial field. Edit: Before pursuing MBA(finance) I think I should know something about it. Please consider my request and oblige. actually i applied for internship and i shortlisted..when will i get offer letter? or will I attend any interviews for that?? Thank you for writing in. The application status ‘shortlisted’ means that the employer seems interested in your application and may get in touch with you after a detailed review. You may have to wait for few more days for the employer to contact you for further details. It takes time for the employers to process the applications. Hello sir i am Mohammed Ashraf. Hello Sir,I am Suvarna Pandit.I have Completed BE(IT) in 2016.also I have Completed diploma in Software Testing.so I want to do internship in software testing.please sir suggest me how can i get good internship. Hi. I am a student of Law. I prefer internships during the month of May. Can’t I apply for it now? There are no internships available on a later date. Thank you for writing in. Please don’t worry. We keep posting hundreds of internships on a daily basis. So, you may visit our website during the month of April- May for the internships in your preferred time. Is it possible to do more than one content writing (work from home) internship at the same time or is there a limit? Thank you for writing in. Yes. You can do multiple internships at a time. We have not set any limit. Thank you for writing in. 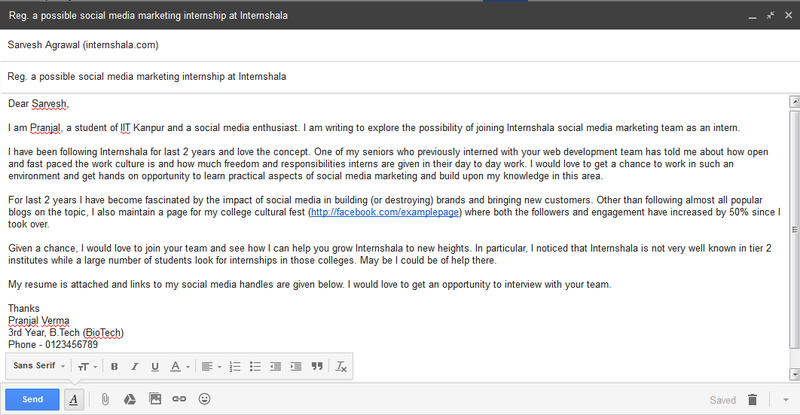 Please write to student@internshala.com. We will look into your applications and profile and help you out. Currently i am persuing 3 year of mechanical engineering in mumbai i was looking for a internship in automobile engineering but it does not show any can you plz help. and apply to the ones that suit your profile the best. sir, can you provide me internship in marketing and part time job. Sir, I am currently studying in second year​, (B.A. psychology honours) from Kolkata and I would love to do internship in psychology. Could you please help me out? I am pursuing B.Tech in electrical engineering. Currently I am in 2nd semester, I want to do internship in IoT . My resume is below average and have no work experience. Please let me know if any internship program is available for me this summer. I am in first engineering and i had updated my profile for internship. My fields of intrest are software development and software testing. But as I am in first year I hold no major knowledege over mentioned subjects. As my first year is at its edge I will be starting with my core branch of engineering. So can I apply for internship to learn practise some basics to get my idea more clear?. Or is it necessary to have any of practical work done by us before? I am doubtfull because I am applying for internship to get some experience and have some practical knowledge. But the organizations are asking for past experience. What should I do? My name is ravinder kaur . I have completed my graduation in Hindi ( Hons) and nowdays I’m pursuing MA from ignou .sir I want to ask that is there any internship available for Hindi (Hons) student ….if yes so how could I get to know about the internships …..
Hello sir, I am Deeksha joshi . I have completed my graduation in 2016. i have done B.sc computer science honours. and looking for internship based on web designing, software testing in pune. pls can you suggest me any company for that. Hi, I am currently pursuing 3rd year of bachelors in Banking and Insurance from Mumbai university. Can you suggest me some companies. I accidentally submitted my application without completing my resume for a company. Is there any way to correct this err of mine. Hope to have an immediate feedback. I have been shortlisted for the internship but I didn’t received any email for further process. What to do know? I am a beginner having certificates of only 10th and 12th class and I’ve recently given my first year exams. I am not having any certificate of diploma course or specialisation in any field. Can you please tell if I’ve any chances to get internship? Or please suggest what should I do.. I recently completed bachelor in mass media degree, i do not have any previous internship experience ,can you please suggest me some internship. Thank you for writing in. The question mark beside the ‘not selected’ application status means that the internship is closed, but the application status has not been updated by the employer. So, if you are hired for the internship, then you can forward us the offer letter given by the employer. We update the status then. I applied for one company it didn’t shows any result and I need internship by july1st so would you plz let me know whether I have selected for the chosen company ??? Thank you for writing in. It takes time for the employers to process the applications. So, you need to wait for few days. Also, keep on applying for the other internships. This will improve your chances of getting hired. I’ve been shortlisted by two companies but I see no email or have not received a call yet.I have applied for internships in the social media marketing,Media&P.R fields.I would be grateful if you could do something about this. Thank you for writing in.Would like to let you know that shortlisted means your application is one of the good ones and company may consider to further assess your candidature and take a call, but it does not guarantee that you would get hired. Among shortlisted candidates, the company may find many better applications than yours and hire them. I am 3rd year chemical engineering student. Can you suggest me any chemical engineering companies to attend internship. Sir i had submitted my resume through internshala and i just want to know that the company i had applied for has seen my resume or not. I am ok if i am not been selected but want to know that if they had seen it or not. Thank u! Thank you for writing in. Employers take time to process the applications. So, you need to wait for few days. If the employers would be interested in your profile, he/she will get back to you and give details regarding the internship. I am a student of msc previous want to do internship from home. please help me find some internshiup related to chemical industry. i also have a great interest in phoyography. Hello i hve dne b.voc in fashion designing can i get intership in any fashion store or any somewhere else?? Plz suggest me its urgent . Thank you SR. For Informing about the secrets. Thanks sr for informing about this. I am currently doing BBA from Asian School of Business Noida. I am looking for internship in ‘Content Writing’ for ‘Work From Home’. I applied for atleast 5 or 6 companies but none replys me. I regularly update my profile and check all the points that u mention but nit getting any internship. What do I do? Thank you for writing in. Could you please write to student@internshala.com from your registered email id? We will look into the issue and update you on the same. I am pursuing b.tech ,civil 4th year and I want internship in any construction company to get good knowledge and experience of work in construction.I don’t have an idea that how to get internship in India because I am Nepali so I need your help to get an internship . I hope you will try best for me .I am waiting for positive response from you. Myself Md Irfan Ansari have completed diploma in Electrical Engineering in 2015 after i joined a company and worked there as a Junior Executive and Production Incharge for 1.6 year and now i am pursuing B.Tech also in same stream.So i am looking for an internship by which i can develop my skill and career and help in building company growth. I am a fresher Video Editor From Mumbai .I Have completed my course in Film & Telivison Editing . Can u plzz suggest me the best Internship for video editing in Mumbai . Thanks for writing in. Please visit https://internshala.com/internships/keywords-video%20editing for internships in video editing. 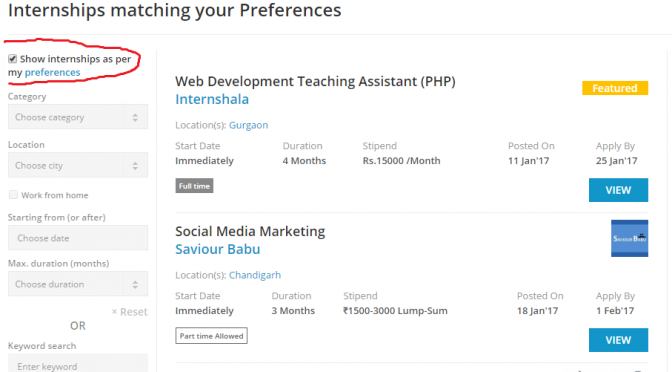 You may visit https://internshala.com/ and apply to the internships that best suit your profile. My name is Kalsaitkar Sarika Gopalrao from Latur. I am fresher of this year. want to start my career in web designeing. I had developed 2 websites using PHP and have the knowledge of WordPress. I like to learn new things. i want to increase my knowledge in web designeing. want to work with different framework. Give me an opportunity to improve my self. i want to become a “KIDA” of web designeing. For that purpose i want to join your internship program. Hello sir /mam I applied for the internships ,but I didn’t get any reply .please help me to know how I start it. Thank you for writing in. Generally, it takes 2-3 weeks for the employers to process the applications. Also, they get in touch with only those students whose applications they like. I applied for an internship but I didn’t get any reply from them. Please help me to know about that. Thank you so much for sharing your secrets. My name is Nawale Komal .I am in last year of computer eng.. Please help me to get internship in this field. Hello, Now I m pursuing BBA 2nd year. In Human resource specialist, can you please suggest me any internship programme regarding this course. Thank you for writing in. Please visit here for the HR internships- https://internshala.com/internships/hr-internship. Hope it helps. I don’t understand the problem. Thanks for writing in. Please visit the following link for HR internships and apply to the ones that suit your interest. Hi, I am Shaima. Sir/Ma’am, can you please tell me about HR internships, as I am from jodhpur, and there are no HR internships available at Jodhpur, Rajasthan. I have done MBA in HR and Finance, nor there are options for finance. Can you please guide me regarding this? Please visit here for MBA internships – https://internshala.com/internships/mba-internship. You’ll find both HR and finance internships. Apply to those which suit your interest. Hello sir/mam, I am pursuing MBA second year. In Finance specialist, can you please suggest me any internship programme regarding this course. Please visit here for MBA internships – https://internshala.com/internships/mba-internship. Apply to those which suit your interest. Hello sir….I am persuing Msc operational research (ist year) from Delhi University . Can u pls suggest me any internship programme regarding this course.i want to do internship in the month of december.pls suggest me. We do not have any internships for this specific profile. Please visit https://internshala.com/internships and browse internships. You may apply to the ones that suit your interest. I am pursuing(3rd year) B.tech in Electronics & Communication Engineering from Rajasthan Technical University Kota (RTU-Kota). I want internship in any company related to my stream so suggest me for any company. Thanks for writing in. Please visit https://internshala.com/internships/electronics-internship and look for an internship that suits your requirements. I’m a student of techno India university , Kolkata pursuing a b.tech career in CSE. I want to know ….what happens if we can’t complete 3 internships before the end of study…..as mentioned by the govt. Of India? I want to do internship in hyderabad. Please visit https://internshala.com/internships/artificial%20intelligence%20%28ai%29-internship-in-hyderabad for AI internships in Hyderabad. When you visit this page, you’ll see a bunch of options on the left side of the page wherein you can filter your search for internships. I am studying my B.tech final year in Sir crr college of engineering Eluru. can I apply more than 1 internship at a time? Yes, you can apply to as many internships you want at the same time. I’m Prajkta pursuing Btech in chemical Technology. Plz suggest entrnship in any chemical Industry. Please visit https://internshala.com/internships/chemical-internship for all available internships in chemical engineering. i am razz dhakal from chittoor i am a mechanical 3rd year student, i need internship in june /july would you please help me to get it. i need near chennai or banglore or any place in south india .. Please visit https://internshala.com/internships for all available internships on Internshala. On the left side of the page, you’ll find various options to filter your search. In the ‘Location’ category, you may enter the city of your choice and you’ll be redirected to all available internship opportunities in that city. Hope this helps. Good luck! What should I write in additional details of my resume? I have only written that I am a blogger. Please visit https://internshala.com/internships for all available internships on Internshala. On the left side of the page, you’ll find various options to filter your search. Please write to us at student@internshala.com if you have any other query. My name i prince and i am pursuing PGDM and i am in the 1st year…so please guide me for the internship. In marketing or sales. Please visit https://internshala.com/internships/marketing-internship for all marketing internships that are available on Internshala. On the left side of the page, you’ll find different options to filter your search. You may choose ‘Sales’ in ‘Category’ option to view internships related to sales. I am a Electrical and Electronics student in B.E. I want to apply for content writing I completed all process please give me information about this. Please visit https://internshala.com/internships/content%20writing-internship for all content writing internships that are available on Internshala. You may apply to the ones that suit your interest. I pursued B. Pharmacy in 2013.Currently I am living in bangalore.I am a homemaker now. Can I get an internship now! I am interested with interior design and psychology. Please visit https://internshala.com/internships/industrial%20and%20production%20engineering-internship for all the industrial engineering internships that are live on Internshala. You may apply to the ones that suit your interest. I am Indu Saini a student of BSc biotechnology 1year .I need to know that is there any internship (summer/winter ) open for me if so please let me know . Please visit https://internshala.com/internships/biotech-internship for all biotechnology internships available on Internshala. You can apply to the ones that suit your interest. I have applied for System Designing.I got the email from the company to enroll it by reviewing it through the link they provided.The link takes to the official page but I don’t find any review tab.Please help me out. Internshala is not involved with the hiring process of any company. Please write to the employer to resolve your query. Thanks a lot for this informative article as i was searching for this similar kind of information and stumbled on your article which i think is great help for people like us who don’t the importance of doing internships so thanks a lot for this article. Kudos to this article.Going to bookmark this for sure. Sir i am apply for just 20days before but I doesn’t get any response from that company please give some solution. This could be because the employer decided not to go ahead with your application. Please apply to other internships available on Internshala. I am graduation dropout student. Having 1.7 yrs of experience in Admin assistant job & now looking for internship in same field or in HR assist roles. Please register here – http://bit.ly/new-registration to begin your journey on Internshala. Once you’ve registered and logged into your account, you may click on the ‘Internships’ button on your dashboard. For internships in HR and general management, you can select these fields from the ‘Category’ option given on the left side of the internships page. It’s really a nice and helpful article for job seekers who wish to start their career. It’s great chance for job seekers. I am happy that you simply shared this article with us. Thanks for sharing such an useful article with us. Looking forward for more post.